In the face of mounting pressure to wrap up NAFTA negotiations by the end of the month, a senior source suggests Canada is comfortable with missing that deadline. The source who spoke to CBC News on background, due to the sensitivity of the talks, said the external political pressure "is not a good enough reason," for Canada to be forced into a fast finish. If outgoing president Enrique Pena Nieto signs the agreement, it will, among other things, give AMLO some domestic political cover for unpopular aspects of the pact. In order for that Dec. 1 deadline to be met, a series of legal hurdles in the U.S. must be cleared first. The next step in that process is getting American lawmakers the text of a proposed agreement before Oct. 1, to begin a formal review. The source said Canada is willing to try to accommodate the timeline, but is prepared to keep talking past the end of this month. Last month, Trump announced the U.S. and Mexico had reached an agreement in principle. Trump plans to rename the agreement USM, which stands for United States and Mexico, The Wall Street Journal reported on Thursday. Trump reportedly said he would add a 'C' for Canada depending on what happens at the negotiating table. On Thursday, Mexico's chief NAFTA negotiator, Kenneth Smith Ramos, added his voice to the pressure campaign. "Mexico stated from the beginning of the negotiation that the ideal scenario is for NAFTA to remain trilateral," Smith Ramos wrote on twitter. "We hope the U.S. and Canada will conclude their bilateral negotiation shortly. 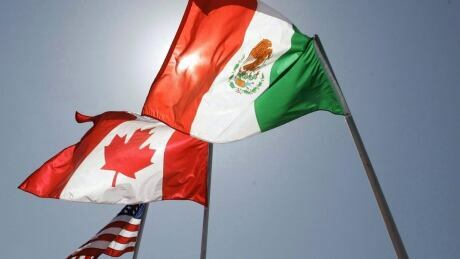 If that is not possible we are ready to advance bilaterally with the U.S ... the agreement in principle that we closed with the U.S. is positive for Mexico because it preserves free trade and modernizes our trade agreement ..."
Despite the threats of leaving Canada behind, there are significant questions about whether NAFTA can even be changed into a bilateral agreement. U.S. members of congress granted the Trump administration the authority to re-negotiate a trilateral agreement, and it is unclear whether the White House has the power to turn NAFTA into a two-way pact. Members of congress from both parties have also said they would not support a new NAFTA without Canada's inclusion. Foreign Affairs Minister Chrystia Freeland is expected to return to Washington sometime next week for more high level negotiations with her U.S. counterparts. A second source tells CBC News there is still a lot of technical work that negotiators need to grind through, adding talks are "slow."